Did they repair or replace the gates? Total cost would be interesting to know. I don't know if they replaced the gates. I know they always leaked whenever I walked over the spillway and the water was gushing out of either the top or the bottom. I always thought it was scary and I walked as fast as I could across the spillway. I'll try to find out but I doubt it. I would have heard something about it. I'll also find out the total cost of the repairs...it's in the billions. I think Paradise is worse off than the spillway - monetarily wise. I did a Google on the repair costs and several news agencies is saying $1.1 billion for repair. DWR also gave a presentation about the vegetation known as the “green spot” on the face of the dam, which Gallagher said “helped dissuade concerns about a piping issue.” The assemblyman said there was also a discussion about the spillway gates, which the department has been monitoring closely. Tests have shown them to be stable, but the department will continue to assess whether the gates need to be repaired or even replaced, he said. Gallagher said he is focused on long-term changes to the facility and its operations. “I do feel confident that once this is done we’re definitely going to have a much better, stronger spillway, the spillway we always should have had,” he said. What I saw on a daily basis for well over 10 years was lack of maintenance. The maintenance I did see done on the spillway were contractors sealing the cracks in the upper and lower spillway. Once a year in the summer, a maintenance crew would get the hose out and clean off the pigeon and swallow poop from the gates and headway to the gates. They did install a hawk screeching machine in the spillway to keep the pigeons away, but all that did was bring more pigeons in. HA! The pigeons landed on the fake hawk screeching machine and pooped all over it. They can blame it on whatever and whoever they like, the blame lies squarely with no maintenance and money from Sacramento to fix it. Actually, they were probably waiting for the day to fail to fix it properly. Now that the work is done, the finger pointing has begun. Those responsible have long been retired or dead. Why does none of this surprise me. This had a beginning but seems to have no end. Bardou you are a digger! Ran across this on another forum, a you tube film of building Oroville Dam. My wife's uncle worked on the Dam building tunnels for the power house. Okay, I have mentioned that the spillway is complete so when are they going to use it? Here's the latest from Juan Browne. Thanks for sharing that video, I hadn't seen that one before. This is going to hurt So. California and central valley farmers. Here in Oroville, we do not get our water from Lake Oroville, our water comes from Miner's Ranch Reservoir. My water bill runs around $10 - $11 per month. The work is 99.9% complete on the spillway, minor work of back filling and putting in roads below the emergency spillway is still ongoing. Word is the dam will be open to the public in July, and fireworks is scheduled for July 4. If so, it will be choatic up there, it always is after the 4th fireworks. People are the usual pigs and don't clean up after themselves. Also, the spillway may be used this season. The lake is filling up fast and with record snow above us, the powerhouse won't be able to keep up with the incoming water. Let's try out that $2 billion project! SACRAMENTO, Calif. (AP) — The federal government has rejected $306 million in reimbursements for California’s repair of damaged spillways on the nation’s tallest dam, a state agency said Friday. California has so far requested about $639 million from the Federal Emergency Management Agency for the Oroville Dam repairs, said Lisa Lien-Mager of the state’s Natural Resources Agency. FEMA has agreed to cover $333 million. That’s less than about a third of the $1.1 billion the state’s Department of Water Resources said it took to repair the dam. Spillways on the Oroville Dam crumbled and fell away during heavy rains in February 2017, forcing nearly 200,000 people to evacuate amid fears the dam would collapse. Disaster was ultimately averted, but the dam needed significant repair. The agency rejected $306 million in repairs for the dam’s upper gated spillway because it was damaged prior to the heavy rain, FEMA spokeswoman Brandi Richard said. “Two separate independent engineering reviews indicate that a variety of problems existed at the dam prior to the February 2017 floods. FEMA’s Public Assistance can only fund work directly linked to the declared disaster,” Richard said in a statement. “We firmly believe that federally-required repairs to Oroville after a federally-declared emergency should qualify for full federal assistance,” Jennifer Pierre, general manager for the State Water Contractors, which advocates for 29 local water agencies. Last month, the Trump administration threatened to revoke $3.5 billion for California’s high-speed rail project, prompting a battle with California Gov. Gavin Newsom. There’s no indication FEMA’s decision is related. The Stafford Act and others have certain requirements for damage repair reimbursement by FEMA. Part of the damage was due to underlying poor construction and design, part to failure of maintenance. This rendered some repair costs non-reimbursable. "Maintenance" a lack of it. There's some FERC reports that are confidential and the public isn't privy to seeing them, but I'm sure FEMA has access to them. Probably why they made the decision they did. California’s Democratic political leaders fancy themselves as leaders of the anti-Donald Trump “resistance” and are engaged in legal and political conflict with the White House on dozens of specific issues. Thus, when the Trump administration declared last week that it would not reimburse California for $306 million of the $1.1 billion cost of responding to the near-failure of the Oroville Dam two years ago, many saw it as just another front in the Sacramento-Washington feud. In this case, however, the Trumpies are right, and California politicians should be grateful that the federal disaster aid isn’t zero. The Federal Emergency Management Agency correctly concluded that it—meaning all U.S. taxpayers—shouldn’t have to pay for preventable structural problems that existed before the dam’s two spillways collapsed. During the very wet winter of 2016-17, Oroville, the most important piece of California’s state water system, filled rapidly. Dumping water down the dam’s main spillway and into the Feather River enlarged a fault in the concrete slope that quickly widened and deepened into a cavernous hole. Fearing that the spillway would collapse, the dam’s operators shut its gates, and as the reservoir behind the dam rose, it began spilling water from an auxiliary spillway. But the auxiliary opening—just a low place in the dam—poured water onto a dirt-and-rock face of the earthfill dam, causing massive erosion that threatened the structural integrity of the dam itself. Reluctantly, but necessarily, operators reopened the main spillway’s gates to allow water to escape, virtually destroying it. Meanwhile, with the dam itself in jeopardy, nearly 200,000 people living downstream from the dam were evacuated. Disaster was averted, but the costs for the emergency response and repairs to the dam are heavy, and the water agencies that rely on Oroville for their supplies—San Joaquin Valley farmers and Southern California residents, mostly—are on the financial hook for them. The state applied to the feds for reimbursement of as much as 75 percent of those costs, arguing that it was a weather-caused emergency, much like a hurricane or a tornado. It was a weak argument from the beginning, because it was apparent that the state had failed to fix defects in the main spillway when they first appeared and had rejected suggestions from outside groups that the auxiliary spillway be “armored” to protect the dam from erosion. “Due to the unrecognized inherent vulnerability of the design and as-constructed conditions and the chute slab deterioration, the spillway chute slab failure, although inevitable, was unexpected,” the panel’s report said. In a nutshell, had the dam been constructed and maintained properly, it would have been fully capable of handling that winter’s rain and snow runoff. So the incident was caused by human incompetence and neglect, not by Mother Nature. The feds are willing to give California $333 million to offset repair costs. Given the findings of the engineering panel, state officials should be grateful. However, they plan to appeal their claim’s partial rejection, which is based on pre-existing problems in the dam’s upper spillway. “We believe otherwise and will work with FEMA to submit additional supporting information through the appeal process,” Lisa Lien-Mager, a spokeswoman for the California Natural Resources Agency, told the Sacramento Bee after last week’s announcement. LaMalfa said FEMA reimbursed the state for eligible repairs but will not pay for “disasters caused by negligence or maintenance failures.” An independent safety review in September 2017 found that design and construction errors, along with lack of state oversight, caused the Oroville dam's spillway scare. In an internal DWR memo, state engineers also expressed concern about the dam’s design, construction and age and questioned the ability of seven other similar California dams to “safely pass a flood event.” FEMA typically pays 75% of eligible disaster costs. Concerns around a potential spillway failure necessitated the evacuation of 188,000 residents living downstream from the dam. The state awarded Kiewit Infrastructure West $630 million of repair work at Oroville, but total costs could exceed $1 billion. Much of the construction work, according to LaMalfa, has been carried out with the goal of making the spillway work properly and cannot be funded under an emergency declaration. The federal government did, however, offer California some relief in another area related to the dam incident. The USDOT in February announced that it would provide, through the Federal Highway Administration, $2.8 million in grants to repair roads in three counties that were damaged by equipment brought in during emergency repairs. Last month, the U.S. Army Corps of Engineers released an update to the National Inventory of Dams. The average age of the country’s 91,468 dams is 57 years, and, according to the Association of State Dam Safety Officials, it would take $64 billion to make all the necessary upgrades and repairs to state and federal dams. It would cost $22 billion to fix the most critical dams, according to the association. I just read on FreeRepublic that the repairs may not have worked. Any truth to that folks? The numbers do not look good. Water is starting to seep down the rebuilt Oroville Dam spillway. California Department of Water Resources officials said Wednesday this is common and will not affect the operation of the dam's gates, which are not watertight. DWR in its latest update posted Tuesday it does not anticipate using the reconstructed main spillway in the coming days. However, state officials said the spillway may have to be utilized later this year. If the main spillway needs to be used to manage lake levels and flood control for surrounding communities, it will be able to handle flows, state officials said, noting it has been rebuilt. 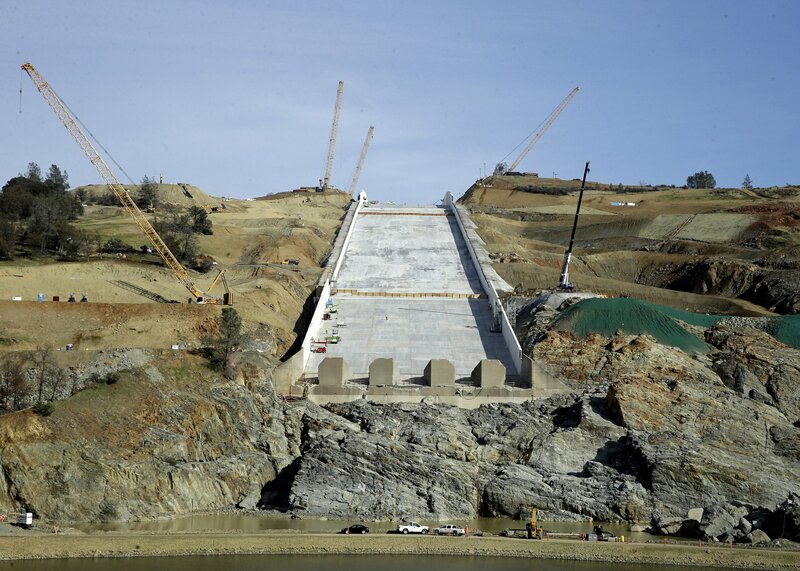 The emergency spillway also was rebuilt in the wake of the Oroville Dam crisis two years ago. Lake Oroville is at 66 percent capacity at a level of 814 feet, state officials said Tuesday. Estimates are that the lake’s level will be 835 feet by Saturday. On Tuesday, releases from the Hyatt Powerplant were at 5,000 cubic-feet per second — or 37,400 gallons per second — with planned increases, the Department of Water Resources said. Just drove by there, the water is coming from the gates. The water is behind and up to the gates and water has ALWAYS seeped from the gates. No big deal. Just like those 2 green spots on the dam, they dry up in the summer. Presume they are not going to repair the gates in the foreseeable future. I had to laugh at the American Thinker article posted...They reported that the lake holds 3.5 million acre-feet of water; in February 2017 they opened the "huge spillway gates to allow 100,000 acre-feet per second to race down the face of the dam". At that rate they'd empty the entire, full reservoir down to the last drop in 35 seconds. What's even more funny, is that the water never reached the top of the dam, it breached the emergency spillway. That's when DWR panicked because they had no idea how much water the ES would handle. When the ES started to be undermined, that's when the spillway gates had to be opened and let it rip. The water is up to the gates and the lake is filling up fast. I doubt the powerhouse can keep up with the inflow as we've got a lot of snow above us. I've walked across the spillway when the water was at the gates and saw the water shooting up over the gates and the gates were closed. I hope they open the gates and test out that new $2+ billion spillway. Lots of boaters are enjoying the lake the past couple of weeks. I heard DWR will open up the top of the dam for July 4 fireworks. I see them from my house so I avoid the nutso crowd. When they open up the dam to the public, I'll go once to walk it just to see what all has been done, and to meet other walkers we knew in the past. They'll have to repave the top of it as it's a disaster with all the heavy trucks and equipment rolling over it. No one should panic, all is well up at the dam. It's been talked about. IIRC, the seals replaced about 5 years ago. I saw them working on them and even talked to the workers working on them. There was talk about replacing the gate heads as there are cracks in the gate heads (concrete). There's a forensic (FERC) report that was put out by a UC Berkeley engineer when the spillway first exploded. In that report were pics of the cracks. It may be on this thread somewhere. FTR, the gates have always leaked water when the gates were closed. Well, that spillway looks mighty stout to me. I saw on all the cams daily what they worked on and I can say that there's rebar - massive rebar, RCC (roller compacted cement). They're going to have to open up those gates, let the water go at 350,000 cfs (what it's built for), and let's see if it fails. If the spillway hadn't of failed in the past 50+ years, why would a new spillway fail? I see no evidence of it. Open the gates! Okay, time to go internet hunting for info. Here's the latest youtube video. Some of the video I believe is NOT recent. There's no crane at the bottom of the spillway (there's one in the video). There's no equipment on the spillway. They are working on the hillside near the spillway. Some blasting was done a week or so ago. Small earthquakes have been measured at the dam...hmmmmm. I think the network KPIX did some old video splicing to make this new one. I don't know what "green bands" going across the face of the dam means, and I haven't seen them and I did look for them. At the foot of the dam near the pump house, there has always been a "green spot" but it goes away in the summer. There's another one located on the south side of the dam face that runs about 100 feet the length of the dam heading east to west. That has been there as long as I have walked the dam and it always turns brown in the summer. Here's a new video just out about "Oroville Dam Failing." The only water or streams of water I saw today were running down the side of the new spillway. If you're standing in front of the spillway, you can see the water running down the right hand side. I don't even think it reached the stanchions at the bottom of spillway. I did not see what they were showing on the video. So, it's wait and see now. We're in no danger at my home as we are above the dam, but those down stream if the dam should fail, are SOL. Clear down to Merced and then some. Catastrophic! I will say that there was a tremendous amount of weight put on that dam road. I'm talking thousands of semi trucks loaded with rocks/cement/sand/cranes/cement factory/CAT trucks/you name it. All that weight and traffic had to put a load on that earthen dam. Well, I may have to change my mind here soon about the trustworthiness of the spillway and dam. I'd like to hear from some civil engineers on their take. I guess the big test will be releasing water. I went back and viewed the spillway in the video above. The video of the spillway is from the top view of the road going over the spillway (closest to the gates). I can't see that portion of the spillway from E. Oro Dam Rd. I can only see it from where the spillway makes the downward turn. It does look like there's water seeping from underneath the newly poured slabs. Where is it coming from? I have my best guess. It's leaking underneath the gate head slab where scouring has taken place. Remember now, there's water up against the gates and probably seeping under that lip that joins the spillway with the gates. I DO NOT KNOW IF THAT PORTION WAS REPLACED. I do recall Cahill talking about that particular area early on when the spillway busted. Other "experts" commented on that area as well. The same area where there are leaks coming up is the same area I saw repairs being done back 5 years or so ago. There were cracks there and water did seep from those cracks. This is why I was not surprised that the spillway failed. The water just came up to the gates a couple of weeks ago when the spillway was deemed done. So of course workers/inspectors would not see any water coming up from the slabs because the water was still far away from the gates. Well, FERC better be on this and qualified engineers alike. No doubt word will get out here about this and people will start to panic again....whether true or not. Bardou, thanks for keeping an eye on the situation. You have credibility on the subject. Once, we had a fairly real time data stream on the dam and increase in the water level. .
Do you then have any information that FERC and/or qualified engineers are working on the problem? I assume they are, but how many and how hard? If FERC and .gov can get some credibility, they could reduce panic and keep rational control. There are a lot of critical eyes on this situation. Reports of a '100,000 acre feet per second' don't help. As you can see, more is coming than going out. If this keeps up, they'll have to open the gates. We're at 75.5% capacity, and look at the snow pack! I've got landmarks around the lake that I view each day, I'm not getting excited about it yet. I forgot where the cutoff is and get out dodge alarm goes off but I want to say 900 feet. Sheriff will alert everyone before it reaches that point. It isn't going to be like before. I'll see if I can find the get out of dodge level is. The water level on Oroville Dam has dropped below 901 feet, which is the edge of the emergency spillway. NO NEW EMERGENCY SPILLWAY HAS BEEN BUILT! On the west side of the emergency spillway where the water flowed and took out everything in it's path is all now cemented over. I bet anything that the water is coming underneath that emergency spillway and seeping underneath that newly laid RCC. I had workers telling me this way back in 2017, and I saw pictures of it that they took on their phones. If they would have been caught taking pictures, they would have been fired. Some did get fired early in the spillway being replaced for taking pictures. I think it got posted somewhere in this long thread. In Juan Brown's latest video that I posted above, you can clearly see the RCC in front of the emergency spillway. That's to prevent the washing away of the ES and the hillside should there be another failure. TPTB will never ever allow water to run over the top of the dam. That would be devastating. The gates will be opened and that's their only hope to give people enough time to get out. Last edited by Bardou; 03-18-2019 at 11:29 PM. Here's the daily stats for Lake Oroville. As you can see, there's more water coming in than going out. Water seeping under the new ES. Water leaking out from the lip that joins the gates to the MS.
Water leaking through the gates themselves [which is a definite long term problem]. Having seen many pictures of the repair work I don't recall seeing any of the gates area. I can see why the federal government is unwilling to just hand over money for repairs as California government is not putting money into many public projects like roads, railroads, bridges and dams, but reroute the money where it ends up in their pockets. A good example and where California is headed is Venezuela and their electrical grid and rather than put money back into up keep of the country they put it in their pockets. Oh and how is the SNOWPACK around the dams near by area? Bardou, our thanks to your fantastic reporting of what's going on, at the dam! I also appreciate seeing Juan Browne's videos of his visual analysis of the area. Potentially leaking underneath the ES. On the spillway itself at the gates is where I suspect the water is getting in underneath the spillway. Yesterday I saw lots of CAT mining trucks removing soil on the south hillside (close to the dam). That's been an ongoing project from the beginning. I notice a lot of erosion from that hillside during the last rain. There are several spots that could potentially cause quite a landslide into the diversion pool. Our hills here are saturated with water. The past couple of weeks, the semis are back at it hauling huge rocks to cover the places where the hillside has already slide and eroded. Are they in a panic? More rain expected tonight. That's where I'm placing my best guess. Cahill has been tweeting about this so I plan to start following his tweets. He's not an engineer, but he is an "expert" on earth dams. We're going to have to wait and see what the fast talkers say. Yes. Even in one of the videos the DWR director said that the gates aren't water tight. But she can't blame the water leaking underneath the slabs from water leaking through the gates. Water leaking under the slabs is a whole different issue. It's not condensation either! You won't see any videos of the repair to the gates either. There's a lot of wood on the lake which is normal. Last year they had cranes on top of the spillway with guys in buckets and another bucket removing the wood from behind the gates. The removal was an odd way to do it, but I'll look from another vantage point today to see if they're removing any wood from behind the gates. If they have to open the gates the wood has to be removed. Normal removal are 2 boats with booms that gather the wood and take it across the lake near the Green Bridge. People drive down there and get it for art projects or for firewood. So, looks like I go snooping around again today. I'll have more info later this afternoon. This is a bad time for me for TSTHTF. DH is having surgery next week - major surgery. He'll be safer at home than in the hospital. but the recovery has to occur at the hospital - at least a week $hit happens. One more thing. Oro Dam East Rd., was not open to the public up until about 2 months ago. So, we were not allowed to drive on the road and scope out what was going on. However, DWR did set up a cam on E. Oro Dam Rd., facing the spillway. I don't know if the camera is still in use. It hasn't been due to the rain and the solar panel attached to the camera wasn't getting any sun. I'll look around for a link. Thank you Michiana, I try to tell what I see as best I can. Knowing about the past and what I saw, I'm not surprised at any of this. Kiewit has a good name for construction on dams, DWR doesn't. I do not trust them at all. I believe everything that is said about them is true. Liars, sexists, on and on. Why did all the previous directors (4+ of them the past 2 years resign)? None of them wanted any part or the blame for any of the incompetence of those that preceded them. I would also like to extend my thanks to Bardou, her reportage is more trusted in my mind than any of the news outlets. May your DH fare well, ma'am. If we go down so does the rest of the US. There's plenty of areas around the US that has been devastated with flood, fire, hurricanes and tornadoes. People pick up the pieces and move in. Just like we're doing here with our fires. I guess if we want to survive we do what we have to do. If the dam goes, I know we'll have people headed up my way. Everyone I know up here has a gun and won't take any prisoners either. Sheriff told everyone from the beginning that we're pretty much on our own. I'm not scared or afraid to dig my heels in. We've got a huge snowpack up above us. It's warmed up here the past 4 days and warm today, then rain tonight. The snow is melting fast, that's why there's more water flowing into Lake Oroville than flowing out. The powerhouse can't keep up with it, so I believe a release is coming soon. Isn't that what the spillway was built for? Keeping our fingers crossed. I think the butts are in a major pucker factor right now at DWR. Thank you TheSearcher I appreciate that. I'm more concerned about DH than I am the dam.